A couple of spots just opened up for our shopping trip to the Marburger Farm Antique Show in Round Top, Texas on Wednesday, March 30th at 11:00 am. A work day, I know. Hard to get away. Then again, this isn't just any flea market! 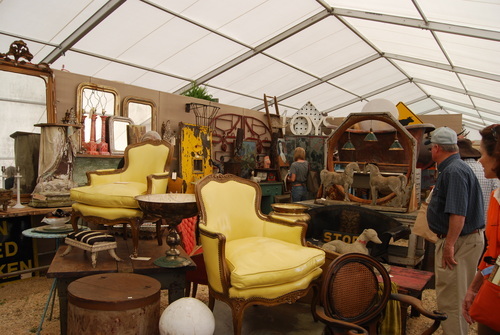 It's one of the absolute best in the country with over 350 dealers on 43 acres in ten huge tents and 12 historic buildings! 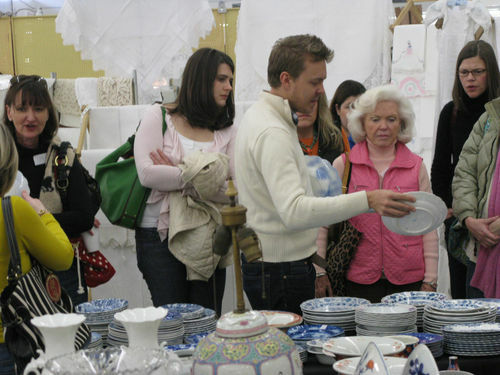 Our trips last about two hours, during which I show you my best picks for the day, including china, silver, linens, lighting, furniture, fabric and art. I'll show you how to look past unsightly finishes on furniture and dated uses for objects, inspiring you to give new life to old things! 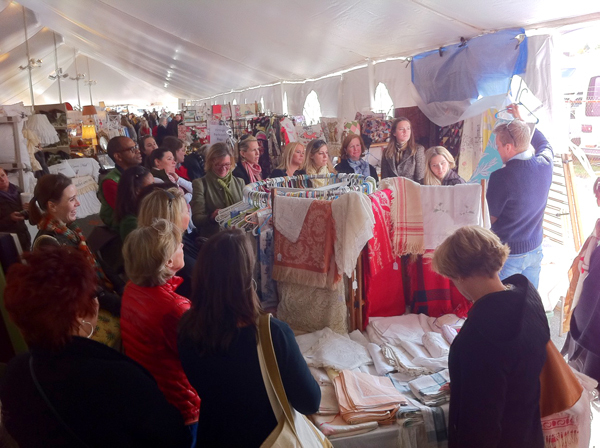 Here's what the Atlanta Journal Constitution had to say about one of our trips to the Scott Antique Market in Atlanta. And here's a feature from the New York Times. While in town, we're also shooting another story for my flea market makeover column in Southern Living. For the first one, due out in just a few weeks, I scoured the aisles of the International Collectibles & Antiques Show in Charlotte, then did a makeover you'll love! The trip to Marburger on the 30th is $60 per person. Email Jaithan (jaithan@eddieross.com) for a spot. See you in Texas, everyone! I want the yellow chairs! With the trim painted white….love them. Unfortunately I live in a ‘no flea market’ area. Darn. I hope you get to meet my friend Kellie of Cashon & Co. while your there… she’s amazing! I am a true Marburger fan through and through but it is really a bit more upscale and I think harder to find diamonds in the rough. Have you considered going to Warrenton sometime? It runs simultaneously as Marburger (actually a little longer) and is only minutes down the road and is quite a bit more flea market-esque! Oh I so wish I were closer I would go for sure. So much fun. oh eddie, i only wish you were coming opening day! you’ll miss all the fab displays that we work on for four days to put together! come see me in tent h booth 15! Sounds like a good time. 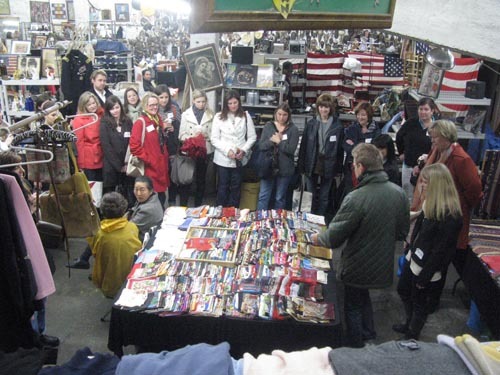 I visited the Antique Garage flea market in NYC on a recent visit. I needed you there to guide me with suggestions. y’all, one of these days i am going to get to come on one of your excursions. wish this was the one! Wish I could come! It sounds fun! Makes sense that this is a great show because isn’t everything bigger and better in Texas?! Wishing I could be there to snag one of those openings. I feel sick I cannot make it now that I live in Texas! Still trying to work something out. And what a small world….I swear my sorority little sister is in one of your images above. I just emailed to see if she was there. Too funny! Oh this sounds like a blast. Can’t wait to see the makeover. I wish you were also visiting La Bahia – we have over 1,000 sq ft of antique linens there! 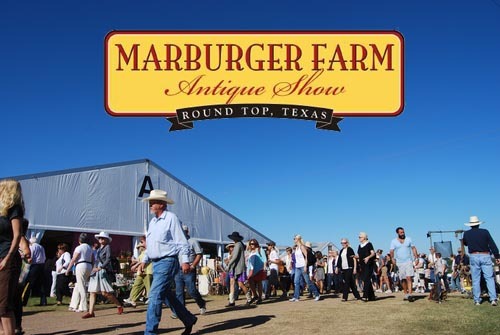 Can’t get away to Marburger during the show (which it is), I wish I could join you! Don’t tempt me… Your flea-xursions are the best! Oh how I wish I could see Round Top through your eyes. So jealous – I did a story on Round Top when I was Home Editor at All Woman magazine – James came with me and we had a wonderful time- remember eating fab BBQ and drinking big lemonades and iced tea as it was so hot. Found some wonderful tin pieces down there which now hang at my home here in Ireland. Hope you and Jaithan are well – enjoy yourselves. I just caught sight of our Dovecote Decor group at your Charlotte tour. Eddie is beyond creative and amazing sharing his ideas of new ways to use old things. We loved it! Hope to see you guys at market. I reaaaaally wish I could come! Have a great time! Be sure to keep an eye out for the guy that makes coffee out of a converted VW beetle. Best stuff ever! Oh, you know I wish I could be there. You’re sure to receive a Texas size welcome from the folks in the Lone Star State!!! I wish I could make it since I’m so close Dallas to be exact. My plate is full maybe next time your in Texas? You know I would love to come!!! It wil be such a fun day! !Have a great time E & J! One of those spots is MINE!!!!!!!!!! Aahhhh….so dern sad I cannot make it now! Really & truly, sick-sad. I guess I’ll say “have fun!” 🙂 Enjoy TEXAS!! We met at Zapp Hall in Warrenton, Texas and I have cookies that I would like to send to you and Southern Living. Is it possible that you can send me an address for shipment? You will absolutely loooove these cookies.